This method is suitable for Years 9 – VCE students. 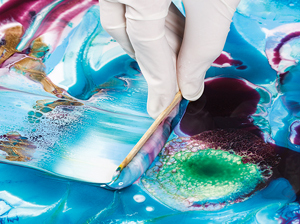 Use Epoxy Glaze 609 to create a unique and amazing resin piece of art. Read all instructions and safety precautions associated with this resin process. When working with resin, wear a mask, gloves, eye protection, tie back hair,and work in a well ventilated area. Make sure you are working on a table covered with plastic sheeting to prevent damage. For best results, raise your canvas or board off the surface using plastic lids, containers, or buckets (depending on the scale of the work). 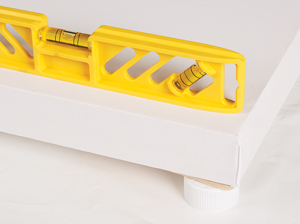 Remember to also support the middle of any stretched canvas to avoid pooling. For more information, join our workshop! Our consultants are highly skilled and knowledgeable in resin and offer some great tips and tricks to achieve the best results. Step One Elevate your chosen painting surface from the table, with wood blocks or bottle caps pushed in under the edges of the artwork. 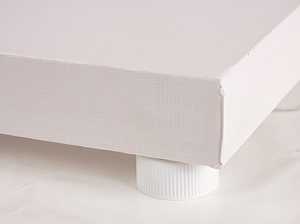 Surfaces used may be Stretched Canvas, Canvas Boards, Plywood or MDF board. Step Two Use a spirit level and adjust the surface elevation with Popsticks where required, to ensure it is level. Unframed plywood larger than A4 in size may cup after the resin has cured due to some shrinkage pull. Step Three Mix resin, Epoxy Glaze 609, using equal parts A and B. This is based on volume not weight, making it easy for you, just use a measuring cup. Step Four Cut the end off a Giant Popstick. Stir using the flat end to ensure all corners of the container are reached during mixing. 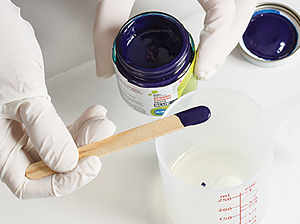 Step Five Adding Colour: Solid Solutions Dynamic Pigment Pastes- Experiment with adding small scoops on a Popstick. Amounts required will vary depending on the colour of the paste. Stir well. Solid Solutions Dyescan be squeezed directly into the clear resin. The dyes are transparent and the pastes are opaque. Step Six Making the art: Pour resin over your surface, make sure not to go to the absolute edge and leave gaps for other colours. 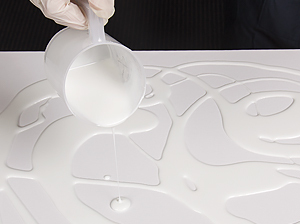 This is a fluid process and as you add more resin it will move to the edge of the surface. 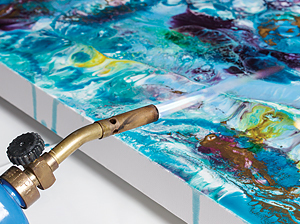 Despite being level, some resin is always bound to flow off the edge of the panel. Step Seven Mix other colours of resin. Combining colours will create different hues. 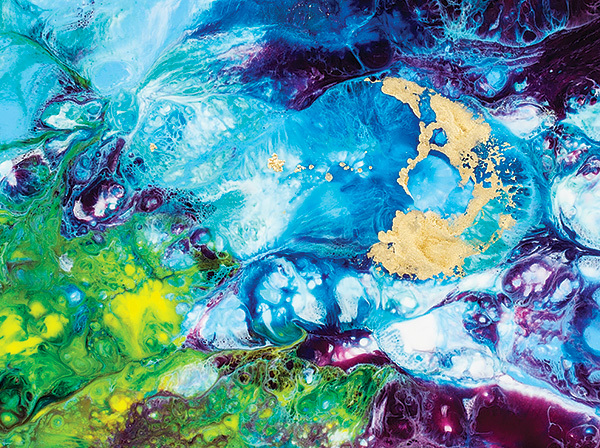 The coloured resin can be poured out in any sequence of colours as a background colour is not required. Keep in mind a little goes a long way. 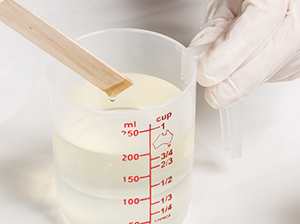 Tip: 1.5 litres of resin will cover 1m at 2mm thickness. Any extra will cause overflow. Any less will result in thinner layer of resin. For thicker resin, apply multiple layers, ensuring you allow the resin to cure between each coat. Step Eight Finishing off: Once finished, run a propane torch or hot air blower over the surface to release air bubbles and smooth out the resin. Allow to dry 24 hours in a dust free area. If any section is not completely coated when dry, apply a clear coat of resin on the surface to seal it in. This top coat will also create more depth of colour. 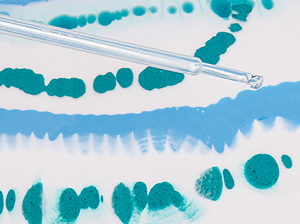 Pipette Use a pipette with Art Clean to create interesting flowing reactions to the resin. Hand sanitiser will also react with the resin. Straw Blowing Blowing resinwith a straw will cause colours to move around. For best results, do this where colours are laid on top of one another or where two colours meet. Dyes & Popsticks Dyes can be dropped directly on to areas of resin then dragged with a Popstick to create marbling effects. Note: they are highly pigmented so only use a minimal amount. Giant Popstick Use a Giant Popstick on its side to wipe large areas of the resin around the surface. 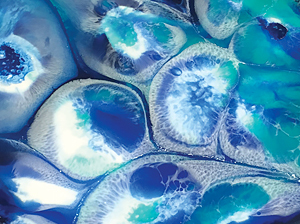 Art Oil Art Oil makes resin move and expand in irregular cellular shapes. Note: Art Oil may cause pitting in the resin if applied in thick volumes or from a great height. Ensure you fill these areas with resin to create a smooth glass finish. 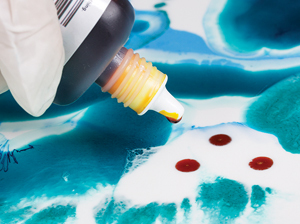 Once cured, wipe back any slimy residue with paper towel (this is just the excess oil coming to the surface and does not cause any harm to your resin art). Satay Stick For fine, detailed lines, draw into the resin with a Satay Stick. The pointed end will create intricate patterns. Tip: There are many types of resin on the market. We stock two primary options, which are both epoxy based resins. 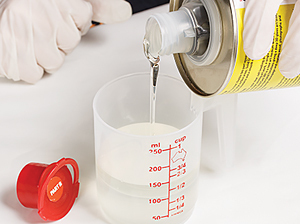 Solid Solutions Epoxy Glaze 609 isflexible (ideal for stretched canvasses)and allows for about 45 minutes working time for 100ml of resin (this is preferable when you want to experiment with the method and allow the resin to interact fluidly on the surface). 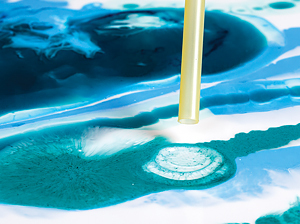 Craft Smart Liquid Gloss will completely harden and allows about 15 minutes working time for 100ml of resin (this is prefereable when you want to have more control over your resin art – whilst the resin is still fluid it won’t move as much). Both resins come in a range of sizes to suit your needs. Note: Curing time fastens for larger volumes as the resin heats itself up. 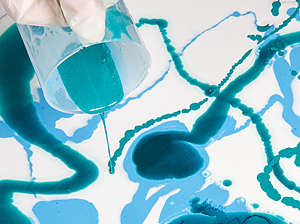 To avoid this, mix up your desired batch size of resin and then distribute into plastic cups before adding your colour, creating smaller volumes of resin, to reduce the temperature and slow down curing time (i.e., giving you more working time). 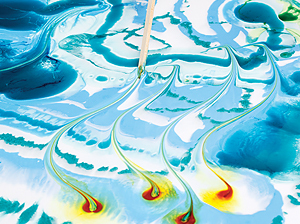 Tip: You may use other colourants such as drawing inks, acrylic paint or mica powder to colour your resin. Be careful not to add too much as it can upset the resin-to-colour ratio and affect the curing process. Try adding a fingernail sized drop per 100ml of resin. Note: If your resin is sticky after 24 hours, there has been a problem and it will not cure! The possible issues are listed below, but be reassured that you can correct this by applying a clear layer of resin over the surface, ensuring you correct the initial conditions. – Part A and B need to be mixed in equal parts, otherwise the resin will remain tacky and will not harden. – Make sure parts A and B havenot been contaminated. – Resin should cure between 20 and 25 degrees celsius for 24 hours (the first 8 hours is most important). If the temperature is higher than 25 whilst working, the resin will cure at a faster rate giving you less time to work with it, but it will still cure fine. If the temperature drops below 20 degrees during the first 8 hours, your resin will never cure and will always remain tacky. If you have any questions, please email our resin consultant Rachel or call(03) 9890 1867 and ask for Rachel.